Applaud Matt Tavares’s latest feat — a gripping tale of real-life daredevilry perfectly balanced by stunning illustrations. When the Great Blondin announced that he was going to walk from America to Canada across the Niagara River on a rope that was more than 1,100 feet long and just 3 inches wide, hanging 160 feet above the raging river, people came from everywhere. Some came to watch him cross. Some came to watch him fall. Some thought he wouldn’t show up at all. But he did show up. And he did walk across the river. And then he did something else amazing. He crossed the river on that tightrope again and again, adding another death-defying flourish each time. Matt Tavares’s gorgeous, riveting account of the daredevil of Niagara Falls is sure to hold readers in its grip, just as Blondin's feats enthralled those spectators on the cliffs more than one hundred and fifty years ago. Matt Tavares is the author-illustrator of Henry Aaron’s Dream, There Goes Ted Williams, Becoming Babe Ruth, and Growing Up Pedro, as well as Zachary’s Ball, Oliver’s Game, and Mudball. He is the illustrator of ’Twas the Night Before Christmas, Over the River and Through the Wood, Lady Liberty by Doreen Rappaport, The Gingerbread Pirates by Kristin Kladstrup, and Jubilee! by Alicia Potter. Matt Tavares lives in Ogunquit, Maine. Tavares’s strength lies in his inviting watercolor, pencil, and gouache illustrations, which convey here the majesty of the waterfall and Blondin’s achievement, as well as the intensity of the hundreds of people who gathered to watch. Their alternately terrified and excited faces add depth to the story and draw the eye. A simple but effective biography about a remarkable talent expressed through striking visuals. Tavares’s sweeping panoramas and direct storytelling easily transport audiences back to those suspense-filled summer days more than 150 years ago. Tavares' color palette captures the stunning falls, river, and forested slopes in gray-white mist, pastel blues, and soft greens...A compressed, respectful glimpse at the achievements of a fascinating 19th-century daredevil. The extra-large format and several full-page illustrations help young readers grasp the enormity of the Falls, especially when Blondin appears as a tiny figure over the great expanse. Dramatically illustrated scenes also allow readers to understand the difficulty of the task, including the careful preparations, en route maneuvers, and evident relief upon returning to solid ground. This would be an inspirational read-aloud for a unit on dreamers and adventurers—those daunting individuals who somehow make the impossible possible. This book is full of nail-biting fun and is great for a historical look at extreme sports, daredevilry, and family entertainment...The fast-paced prose is just as much fun as the illustrations and manages to shine the light on the Great Blondin’s humor as well as his singleness of purpose. Tavares lovingly depicts the Falls in mist- enshrouded aquas and grays; even when the mighty waterfall is off-stage, the white vapor permeates everything. He continually varies the perspective, sometimes giving the reader a bird’s-eye view (as in the vertigo-inducing shot of Blondin holding a bottle aloft with the Maid of the Mist boat far below), at other times composing faraway shots to show the mammoth scope of the surroundings. An author’s note and selected bibliography round out this sure-footed offering. Tavares’ narration emphasizes the Great Blondin’s showmanship as well as his daring, particularly as he carried his manager on his back on one crossing, as the main section of rope sagged under the added weight and a supporting guy wire snapped...there is compensation in the varied and dizzying angles at which the performer’s antics are captured, as well as double foldout spread of multiple stunts. Readers who like death-defying events will appreciate this gorgeous memoir of Jean Francois Gravelet...The stunning watercolor, gouache, and pencil illustrations magnify the meaning of the story both literally and figuratively. An author’s note is included. Students will relish this exciting life story, and school librarians will definitely want to add this to their collections. 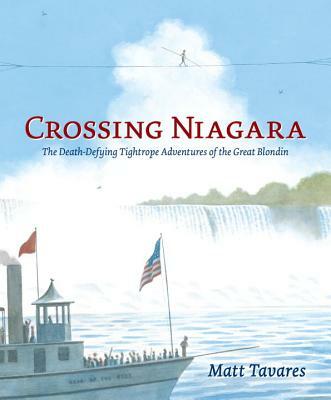 The author-artist of "Henry Aaron's Dream" and "Becoming Babe Ruth" puts his considerable gifts for boisterous narrative and lively illustration to good use in this marvelous picture book about the improbable feats of Niagara Falls daredevil, the great Blondin. Giving new meaning to the term “daredevil,” this highly interesting true story will have readers/listeners hanging on every word.